To the brightest of all Stars...I hope your Birthday is filled with happiness and joy. Love from your friend David. xoxoxo. The Happiest of Birthdays to you, lovely, talented, and generous lady! Dearest Doris . . . You have always been "my inspiration" throughout my entire life and I am now 73. I hope your day is super special, just like you! Happy Birthday, my eternal lady. It's so great to be able to celebrate another Doris's birthday. Next year Lesa and I will be in Carmel to celebrate 92 nd Doris's birthday. Happy Birthday Doris, you gave me many wonderful years of watching your movies and singing along with your records. What a great influence and roll model you have been. Thank you for the joy! What ever will be, will be! Happy Birthday Doris, thank you for movies that you have done over the years, that I play and play and play... with Rock Hudson and James Garner!!!!!... Hi to your furry friends also.!!!!!! Wishing you a very happy birthday! The gifts you have given to us are eternal! Hi Doris! Happy birthday sweet Doris! Dee and I will be unable to celebrate your birthday this year in Carmel with our Doris Friends,, and we are so saddened by this. 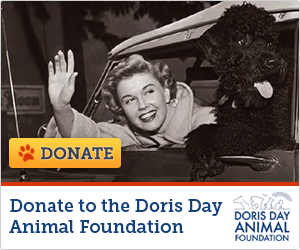 We love you and all of our FRIENDS BECAUSE OF DORIS DAY! enjoy your day, and Dee and I will be singing hppy birthday to you from Sacramento! Happy Birthday Doris! May this day be full of joy as you showed it to the world by singing and laughing all the way in your movies!